I sent him a selection of arrangements to see if he wanted to record them and then in 1994 when he was coming to the UK, it was arranged that we could get together along with my son Peter who was an avid fan. We were able to spend some time with Chet, messing with guitars and talking about a particular arrangement I had made. After this I was meant to go to Nashville to work with him, however I became ill and when I had recovered he unfortunately became ill and we were never able to get together. One of the most disappointing times in my musical career. Chet was an absolute gentleman, not at all big headed and very interested in listening to the music I had arranged. A fond memory of mine was the time he spent admiring and playing our son Peter’s new Stratocaster. Chet’s comment about the guitar was summed up in three words “Nice guitar Peter!”, to which Chet kindly autographed the Strat ‘Chet Atkins c.g.p. 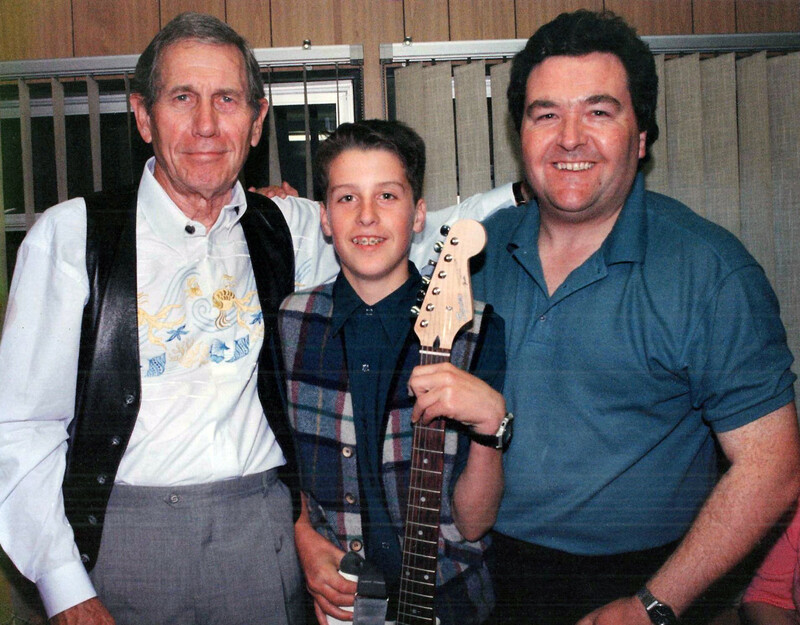 1994’ – Certified Guitar Player, which Chet explained that as he had not been given an honouree degree – he gave himself one instead. So “c.g.p!” was born. I think only four or five guitarists around the world were given this honouree title by Chet, Tommy Emanuelle being one of them.